Cali isn't usually high on the tourists' list of cities-to-see in Colombia. In many ways this isn't surprising: not as developed as Bogota or as technically "refined" as Medellin, it is a gritty and earthy city. Until fairly recently, it was the hideout of the remnants of Pablo Escobar's drug cartel until many of them fled across the border. Despite this shadowy and often violent past, it is one of the country's most animated and exciting places, with great restaurants, an exceptional nightlife and a whole host of museums.Our collection of the best places to stay in Cali are all ideally situated for exploring this fascinating place. Founded in 1536, the once sleepy town rapidly expanded due to the blooming coffee and sugar industries, becoming Colombia's third-largest city. The Old Town, San Antonio, has a wealth of striking colonial buildings, hipster shops, antique sellers, handicraft sellers and restaurants. From the slums to the high-class clubs, the city is full of the sounds of Salsa and the nation's Afro-Colombian heritage is most apparent here. Cali's oldest and easily most beautiful church, Iglesia de la Merced, lies in the Plaza Caycedo and is a wonderful example of colonial architecture. Attached to it is a museum displaying religious art from centuries-gone-by. There are many churches in these parts, all of which are picturesque and the city itself stands in the shadow of the 85ft statue of Christ. However while the historic centre is remarkably beautiful and full of charm, it is important to remain on-guard while you explore it: locals will warn you to not carry a camera or a phone there, as it is still dangerous. Outside the city there is even more to explore because the area around Cali is exceptionally rich in archaeological finds, including two major pre-Colombian sites that include burial mounds, ancient monuments, sacred sites and tombs. Archaeology: the pre-Colombian archaeological sites outside the city are Parque Arqueologico De Tierradentro and Parque Arqueologico De San Augustin. Both were once sacred sites to the indigenous tribes of the region. There are ancient monuments, burial mounds and tombs. Museums: in spite of her gritty reputation, Cali has some of the best museums in the country. Check out the Museo Arqueologico for pre-Colombian artefacts, the Museo de Oro for gold from the Calina culture, or the Natural Science Museum for a great array of rare birds, fossils and plants from the region. Cali Old Town: a place of artisan shops, hipsters boutiques, gourmet restaurants, colonial buildings, antique and handicraft shops. Walk to the Parque El Gato Del Rio, a riverside park with an amazing collection of surreal cat sculptures made by local artists. Churches: the Iglesia de la Merced, Cali's oldest church, is a beautiful example of colonial architecture. Attached to it is a museum holding religious art from colonial times. Check out the 85ft statue of Christ atop Cristo Rey Hill, particularly for the jaw-dropping views of the city. Cali has had a gritty reputation these past few decades, but with its salsa shoes on it is shaking off that infamy: whether it's museums or nightclubs, this ecstatic and exciting city will leave you breathless and the best places to stay in Cali will make your stay all the more enjoyable in this infectiously joyful city. Escape the city center in Acqua Santa Lofts Hotel. Located just south of Cali, the lodges have contemporary designs and each includes a small garden. Either use this hotel as a base to explore the city or just make use of the onsite salt water pool and spa! If you want a comfortable stay only a short way from the city’s main attractions, try Casa del Alferez. The contemporary hotel is chic, artistic and renowned for its fine-dining restaurant. Alfonso Banilla Aragon International Airport is in Cali and takes flights from Bogota. The temperatures remain hot throughout the year but to miss the rain, avoid going in April, October or November. 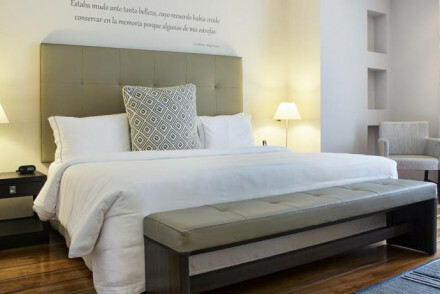 A chic hotel well located in the heart of Cali. Elegant rooms feature polished wooden floors, sash windows, light hues and contemporary art. A hip terrace bar is the ideal start to an evening. Feast on exquisite fare in the fine-dining restaurant. The perfect base for exploring the city. City Style - A hip hotel complete with terrace bar close to the lively centre of Cali. Sailing - Take a river cruise, starting right from outside the hotel, and admire the city's architecture. This hotel is located just south of Cali and features contemporary, designer lodges offering great views. Each loft enjoys its own area of green garden space and there's also a salt water pool. Head into town or instead relax with a spa treatment. An upmarket and incredibly classy place for a trip! Kayaking - Canoeing, slightly different. Views - Mountain and city views.